Live life at full throttle. RIDE is for bike lovers who live and breathe motorcycling. Open up the throttle on more than 100 bikes, featuring classic models from the world’s greatest manufacturers. Customise your bike and rider to an unprecedented degree: choose from a huge variety of parts, components and accessories to build a bike that suits your riding style, tweaking everything from performance down to the position of your rider. Travel around the globe for new challenges and thrills, racing in unique international events on 15 different tracks. Face off against intelligent computer-controlled riders in a variety of single player modes or take on other players from around the world in all-new online multiplayer modes. This is racing. This is freedom. This is RIDE. Customise and upgrade every aspect of your bike – change its look or improve performance with new parts. 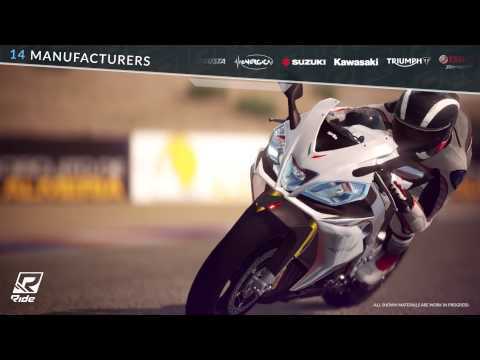 Customise your rider: choose from a range of rider models, liveries and race suits. Reach for the ultimate prize in World Tour mode, beat the records in Time Trial or overtake as many rivals as you can before the time runs out in Track Day Challenge. Select the right setup, change gears at just the right moment, and reach the end of the straight in the lowest time possible during Drag Race.